Liverpool is known worldwide thanks to its two main "attractions": firstly, is, of course, legendary Liverpool quartet - 'the Beatles'. Liverpool is also famous for its development of sport (football and major national races with obstacles are held here on the highest level). Sightseeing, bright life of the city attracts a huge number of young people here from all over the world - many cafes, youth clubs, opportunities for recreation for everyone, energetic nightlife. Walking through the city visit the various museums and exhibitions. Getting acquainted with Liverpool is better to start with a visit to Mercyside maritime museum devoted to the history of the city in whole, and especially to its major seaports. If you have free time - you can look at the original "Customs and excise" museum , where you can learn a lot of interesting information about the history of contraband up to our times. In the southern city there is a beautiful Anglican cathedral, which is the biggest Anglican cathedral in the world, and its bell tower reaches 100 meters! 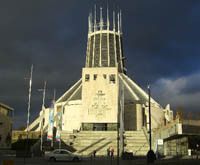 Quite a different style of architecture is represented by another Liverpool Metropolitan Cathedral, which combines elements of futurism and neobyzantian tradition. Fine Art lovers will not have to get bored in Liverpool, because there is a Tate Gallery in London - Walker's art gallery containing works by Rubens, Poussin and many Impressionists. Don't forget to visit Beatles story museum. It is devoted to the legendary band, and the interest to it doesn't get lower with years. Rest in Liverpool is attractive to people of any age and any likings. Welcome!